Rest Day! 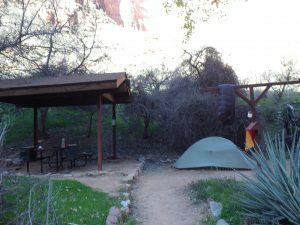 I managed to score two nights at Indian Garden, the midpoint of my trip. 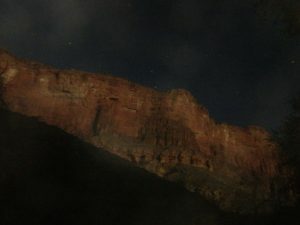 After staying up late, catching up with Mike and eating prehydrated, heavy things I snapped of couple photos of the moon rise, illuminating the Red Wall above the campground. I listened to a few chapters of my audio book and fell asleep to the rustlings of a very large packrat, I named “Spartacus,” and the resident peepers. Day 7 started early, Mike wanted to get going up the Bright Angel before the sun warmed things up too much. Thanks again, for the food, Mike! Back in the campground, I went down to the little “Visitor Center” (it’s never staffed) and borrowed a book from the lending library. You can borrow a book or table game there and when you’re done with it, just put it in the rocket box, in the campground. Pretty cool amenity. I “checked out” the Kolb Brother’s “Down the Colorado,” of course I skipped ahead and just read the section where they boated the Grand Canyon. Seemed like the appropriate thing, given I only had one afternoon to read it. Postscript for Day 7: the small, 100 gram fuel canister I started this trip with finally died, during breakfast. It ran out as soon as my water came to a boil. I boiled 11 liters of water with it, using a Jetboil MiniMo stove. This trip was the inaugural trip for my new stove, and I am quite pleased with it. Woke at first light and packed up. On the trail by 8:15, I would have a mostly dry, primarily shadeless, 10-mile hike. My destination for the afternoon would be Lonetree Canyon. 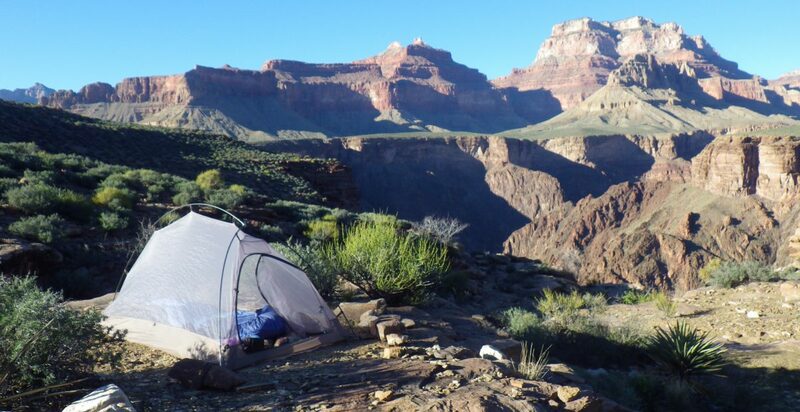 On the way, I would hike past Pipe Spring, the Tip Off on the South Kaibab trail (last enclosed, sit-down toilet on the trip) and head-out the three arms of Cremation Canyon. The first couple of miles to Pipe were mostly in the shade. It’s a true oasis, complete with dense reeds, a bog and dozens of butterflies. 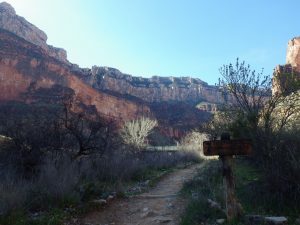 I stopped there to drink a quick liter (I use a Life Straw for trail-side sipping) and then headed on around to the S. Kaibab trail crossing. I could hear the South Kaibab Tip Off before I could actually see it. A group of backpackers was clustered in the shade, under the composting toilet (Sounds appealing, no?) and their “leader” was the loudest woman I’ve ever heard. 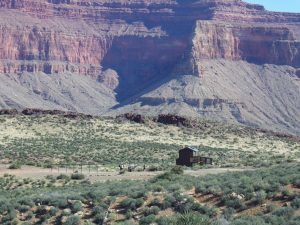 I dubbed her “Bullroarer,” and as she was dropping her extensive, exclusive knowledge of all things Grand Canyon, as loudly as she could to anyone withing shouting distance, I decided I would NOT be eating lunch there. I would just take advantage of the facilities then move on. I have a preference for peace and quiet. Before I left, I asked a young woman if they were heading down to Phantom for the night. She replied that she was, and I took that to mean “all of them.” Boy, was I ever mistaken. I continued on from the Tip Off, hiking past the large cairns that mark the entrance into the Cremation backcountry area, and found a shaded spot for lunch. Looking around, I noticed it was actually part of an archaeological site including a rock shelter, extensive lithic scatter, and small agave roaster. Again, there is a well-established campsite in the center of it. 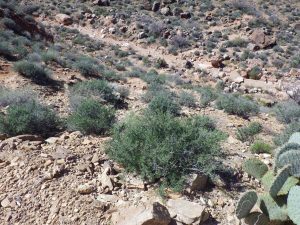 The hike from the Tip Off to Lonetree has a more arid feel to it than other portions of the Tonto. 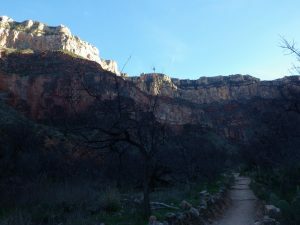 Cremation Canyon splits into three distinct arms or branches and you hike down and out of each one. There is little shade, no water, and the trail is easier to stray off of if you don’t pay attention. Again, a quick meander and it is easy enough to relocate the path. I passed another solo hiker, heading the opposite direction. He was going out the S Kaibab and had come down the Grandview. 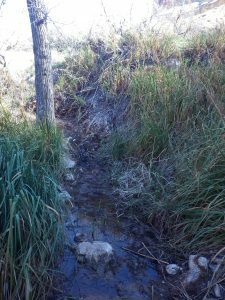 He had good news for me regarding water – lots of it! Just as before, you could hear her before you could see her. She was leading a group of three other hikers. Apparently, the woman I’d spoken with at the Tip Off wasn’t part of Bullroarer’s group, she’d just gotten caught in the turbulence. They set up camp after she loudly announced that it didn’t matter if anyone else was coming in, they would take up two campsites for the night. I ate dinner with my earbuds in, listening to my audio book on the collapse of the Bronze Age, and waited for the peepers to begin their warm up. They do a pretty good job drowning out loud talkers. I determined I’d get another early start the next day, leaving BR and her attendees behind.